ArtFelt Paper - 16" x 118"
Home > Wet & Nuno Felting Supplies > ArtFelt-Paper 16" x 118"
ArtFelt Paper 16" x 118"
At the request of some of our customers, we are now carrying ArtFelt paper. 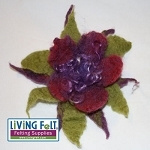 A few of our community member find it helpful either for themselves or for others who have hand strength issues, but still wish to create larger wet felted pieces. 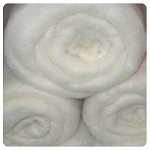 Artfelt is paper designed to assist in the wet felting process, it is made from a starch base durable enough to withstand needle felting to attach the roving design to the paper. roll up the project in a damp towel, secure it, and in the dryer for 15 minutes. Once felted, hen dissolve the paper in boiling water. The 16" x 118" size includes plastic sheeting and printed instructions for felting a lattice style scarf.